NEW YORK -- August 7, 2008 -- The Women's National Book Association is launching the second ever National Reading Group Month in October 2008 to promote reading groups and to celebrate the joy of shared reading. "We champion reading and literacy by supporting reading groups," says Joan Gelfand, President of the Women's National Book Association. Events featuring reading group favorite authors are being planned nationwide in the association's nine chapters including Boston, Dallas, Detroit, Los Angeles, Nashville, New York, San Francisco, Washington, D.C., and the newly formed Seattle chapter. Partners from all aspects of the book industry are joining in to support the launch. In addition to special events, a publicity campaign is planned to reach media in radio, tv, print and internet, nationwide. Says Joan Gelfand, "Our public relations campaign for the launch in 2007 resulted in over 172 articles in newspapers in 19 states as well as numerous magazines, online magazines, web sites and blogs. Over 5 million people were able to read about National Reading Group Month in newspapers, magazines and online. We expect to reach even more people in 2008." October is National Reading Group Month 2008 partners include: HarperCollins Publishers; Hyperion Books; the Random House Publishing Group; Sasquatch Books; Simon & Schuster; and Susannah Greenberg Public Relations. 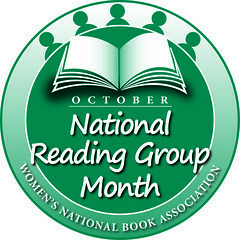 National Reading Group Month is endorsed by: The Association of American Publishers, book group expo; The Book Report Network; The New Jersey Library Association and State Libraries of New Jersey; New York Center for Independent Publishing; and Reading Group Choices. Special Citations from: American Booksellers Association and IndieBound; American Library Association Publishing (booklistonline.com); and the Metropolitan Government of Nashville and Davidson County -- Office of the Mayor [Karl F. Dean]. THE ADVISORY BOARD for 2008 includes: Martha Burns, NRGM co-creator; John Y. Cole, Center for the Book, Library of Congress; Alice Dillon, NRGM co-creator; Shireen Dodson, The Mother-Daughter Book Club; Francine Fialkoff, Library Journal; Carol Fitzgerald, The Book Report Network; Judy Gelman and Vicki Levy Krupp, The Book Club Cookbook and The Kids' Book Club Book; April L. Judge, New Jersey Library Association and West Caldwell Public Library; Ann Kent, book group expo; Mary Mackay, ALA Publishing; Barbara Drummond Mead, Reading Group Choices; and Nancy Pearl, Book Lust and Book Crush: For Kids and Teens. The Women's National Book Association encourages all book lovers, those in the industry and reading groups themselves, to celebrate National Reading Group Month, either by developing their own programs or by joining in to support the WNBA events. The launch and signature event was a special Read-a-thon and discussion at the Center for Independent Publishing in New York. Authors included book club favorites Adriana Trigiani, Wally Lamb, Beverly Swerling, Laura Dave and Matthew Sharpe. The master of ceremonies was Carol Fitzgerald, co-founder and president of the Book Report Network. WNBA's Boston Chapter brought together book group aficionados for an elegant wine and cheese reception with Baker Towers author Jennifer Haigh. The San Francisco chapter celebrated at BookShop West Portal with author Beth Lisick; Los Angeles at Dutton's Brentwood Bookstore, with author Hillary Carlip. Beth Gutcheon, author of Leeway Cottage (2006), and Jamie Saul, author of The Light of Day, joined by Barbara Mead, publisher of Reading Group Choices gave a special presentation on at the Monmouth County Library Headquarters in Manalapan, NJ. SPONSORS AND SUPPORTERS of the 2007 National Reading Group Month were HarperCollins, Random House, Simon & Schuster, Viking Penguin, SoftSkull Press, Sutter Wines, Susannah Greenberg Public Relations, librarian and book group guru Nancy Pearl, Carol Fitzgerald of The Book Report Network, the Center for Independent Publishing, the New York Public Library, Reading Group Choices, the New Jersey Library Association, and the Center for the Book in Washington, D.C. PUBLICITY IN 2007 was handled by Susannah Greenberg Public Relations. Thousands of press releases were sent to journalists nationwide. As a result, over 172 articles were placed in newspapers in 19 states and over 5 million people were able to read about National Reading Group Month in newspapers and online. Scores of literary, library and book trade and association blogs, online magazines and newsletters, including Shelf Awareness, the Book Standard, and Library Journal, covered National Reading Group Month as well. Web pages were dedicated to National Reading Group Month on the WNBA's web site www.wnba-books.org as well as each of the chapters' local web sites. Each chapter also launched its own regional campaign for its local program.